Reg Swartz was a member of an early pioneering family which was part of Queensland’s early history – and whose first generation in Australia were immigrants from Germany and Ireland. On completing school Reg’s father joined the Post Office telegraph service and was posted to a number of country centres and then to Brisbane. His parents were married in 1903, and Reg was born in the family home at South Brisbane, the third of four children. When he was one year old his father was transferred to Toowoomba Post Office, thus beginning a long term family relationship with that city. Reg attended Toowoomba East State School, and commenced his secondary schooling at Toowoomba Grammar School. After a year, his fathers transfer to Brisbane saw him enrolled at Brisbane Grammar School for another year to complete his schooling. He entered the workforce on the clerical staff of the Shell Oil Company in Brisbane, where he met a charming colleague. Romance soon blossomed, culminating in their marriage in 1936. During this period Reg transferred to the sales staff at Shell, and was pursuing his lifelong dedication to Army service. He joined the Citizens Military Forces in 1929, remaining an active member until 1961, when he retired with the rank of Colonel. War clouds were brewing in Europe when the birth of his first child occurred in 1938, and by 1940 Reg had entered Army service full time. Overseas service was delayed until the birth of his second child in 1940, when he then enlisted with the rank of Captain in the 2/26th Battalion which went into training pending their fateful deployment to Malaya in 1941. After the tragic consequences of the retreat down the Malayan Peninsular and the Fall of Singapore, Reg’s problems and that of many thousands of Australian and allied prisoners of war, were just beginning. Reg endured three and a half years in captivity, including an extended period on the Thai-Burma Railway construction as part of “F” Force. War’s end saw a return to Brisbane and a lengthy period in Greenslopes Repatriation Hospital – followed by his Army discharge in April 1946. He returned to work as district sales representative for Shell in Toowoomba. Not long after a third child was born, then a move to the long term family home in Toowoomba. With his strong background in the Toowoomba area, Reg was invited by the Liberal Party to nominate for pre-selection for the Darling Downs electorate. He won pre-selection, then the seat which he was to hold for 23 years until his retirement in 1972. Early in his political career, his abilities were recognised with appointments as Under Secretary for Commerce and Agriculture; and the Under Secretary for Trade. It is a credit to him that in spite of privations suffered in captivity, he worked tirelessly in these roles to establish trade links with Japan, and to set the scent for it to become one of Australia’s top trading partners. In 1961 he was appointed Minister for Repatriation, followed by Health; Civil Aviation and National Development. He also undertook additional duties relating to Parliamentary Operations including Leader of the House of Representatives. In June 1972 he was created a Knight Commander of the Most Excellent Order of the British Empire in recognition for his services to Government and Parliament. He also retired at the 1972 elections. Reg’s military career revived in 1969 with his appointment as Honorary Colonel of the newly formed Army Aviation Corps at Oakey. 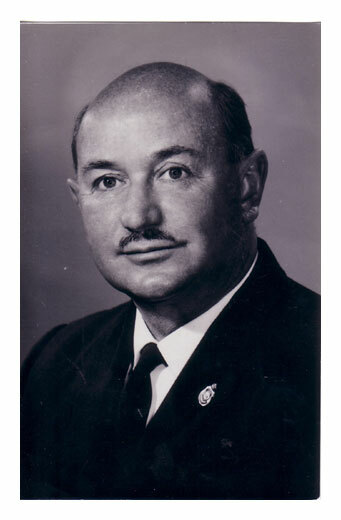 He held this position until 1974, and then continued as a trustee of the Corps Museum until 1991. Following his retirement he semi retired to the Gold Coast, and accepted directorships of a number of companies based in Brisbane and Melbourne, and became more active in the R.S.L. ; Ex-POW Association, and the AIF Malayan Nursing Scholarship scheme. He was also actively involved in the Salvation Army Red Shield Appeal; the Red Cross and a number of other charities. Reg retired from most of his directorships and he and his wife moved to Melbourne. He involved himself with many community activities including Board of the Doncaster and Templestowe Nursing Home and foundation President of the Probus Club in Doncaster. After 14 years in Melbourne, and with his wife’s health deteriorating they moved to a retirement village on Queensland’s Sunshine Coast, and Reg became her primary carer. After her death, Reg moved to a unit at Buderim in 1996. Reg had an affinity with water, being once a passionate and competitive sailor, and delighted in all forms of water sports – new boat, needed bigger motor – bigger motor, needed new boat. There were always a boat, surf ski, fishing rods and all manner of nautical equipment for his children and grandchildren to learn about and use. During the next two years a friendship with the widow of an Ex-POW colleague was rekindled, and he remarried in 1998, thus combining two established families with Reg assuming the role of step-father, and later grand-dad to his new family. Reg’s health began to fail and about five months prior to his death he required nursing home care, and entered a nursing home, where he continued to enjoy visits from friends and family members. Early in January 2006 he fell ill, and was taken to hospital. He did not respond to treatment and the family informed that he may not make it through the night. Next morning showed a remarkable recovery with Reg demanding to know where he was and why he was there. A few days later he returned to the nursing home. There followed a period in which he was visited by many family members. Alas this reprieve was only temporary and he passed away on Thursday 2nd February 2006 in the presence of his wife and daughter. Reg was honoured with a State Funeral by the Federal Government, which took place at Caloundra, Queensland on Thursday 9th February 2006, and was attended by many Ex-POW’s; RSL members; and a large contingent of friends.